According to "Wookieepedia," Coruscant was one of the most vital planets in the Galactic Core. And for those who know virtually nothing about Star Wars (yes Wookieepedia was used) there's something substantially more important than the planet itself. Enter: Koruscant Weekend. Koruscant Weekend attributes their styles to the likings of The Strokes, The Cars, and Two Door Cinema Club. The awakening tones and hooking guitar licks with some loud synths aren't hard to trace. Like the infamous Star Wars trilogy, the Bay Area natives have managed to blaze their own trail, defining themselves in the genre of "altronica pop-rock." 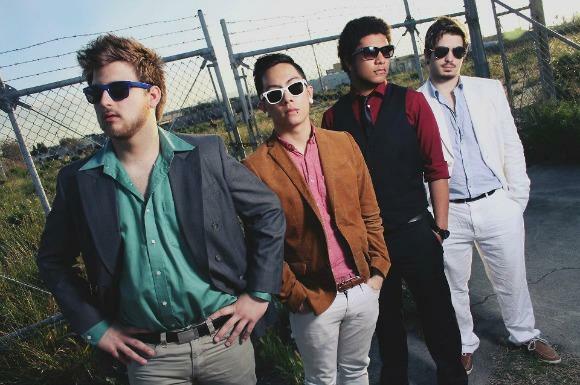 This eccentric, four man wolf pack have even gone as far as classifying their sound as "dancy nerd pop." With two EP's under their belt, Koruscant Weekend's evolution has deepened further than just some catchy tunes for the average geek. Instead, their upcoming EP (out later this year) threads inspiration from Blade Runner and double meaning lyrics to provide their listeners with a complex, yet magnetic dance floor appeal. "Last Train Home", their latest track from their upcoming EP sounds like a blast off into an intergalactic pop rock hit. It's exploding with groove, propelling even the coolest of the cool to get up and dance. As frontman/keyboardist Justin Scorn cries "The life I lead is not the life I led / Your dizzy memory will soon be dead," their cleverness is not only emulated through their lyrics. The tangy guitar riffs, quick keys and loud percussion are played tightly, which explains why they are more "altronica" than electronica. With their EP set to release later this year, be sure to stay up with the energetic tunes Koruscant Weekend will continue to produce. Keep an eye on their Facebook and Bandcamp pages for further updates as well.